ARGH! Where do they get these awesome artists? 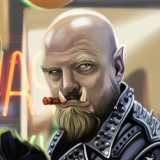 And how can I commission them to draw every NPC of all my games? Honey, I don't think you got enough money! All I want is the rules so I know what the heck these cards are doing! LOL I'm certain I don't have enough money. Which is why I hijack celebrity photos and Photoshop them. Not everyone can afford to upgrade or buy new. There are still Ares Predator-Is out there on the streets. You know that Randall has given us most of the Black Market cards already on his blog right?